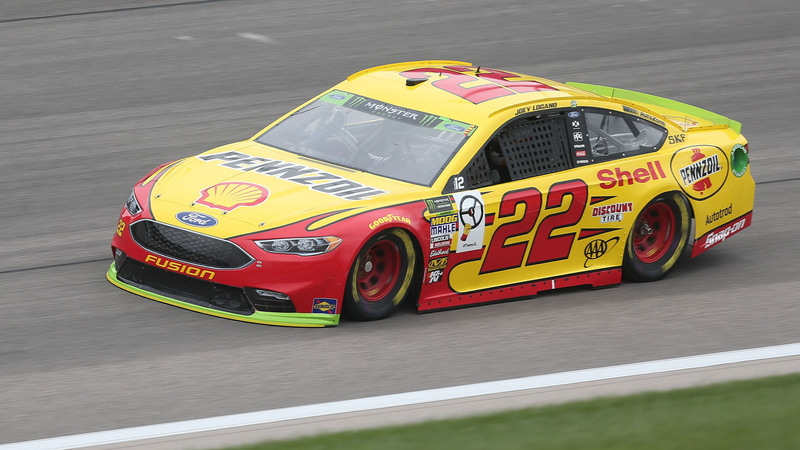 Joey Logano won his first pole of the season Friday as he ran the fastest qualifying time at Kansas Speedway for Sunday’s Hollywood Casino 400 (2:30 p.m. ET, NBC). “It’s been a while since we got a pole so it feels nice to be able to break through and start in a good spot for this final race of the cutoff,” Logano told NBCSN after his run. Logano’s last pole before Friday was at the fall race at Martinsville in 2017. Kevin Harvick, who won the spring race in Kansas this season, will start second. Kyle Larson, who needs a win or massive help on points to move on to the Round of 8 in NASCAR’s playoffs, wrecked in practice and finished 27th in qualifying in a backup car. 1. (22) Joey Logano (P), Ford, 191.646 mph. 2. (4) Kevin Harvick (P), Ford, 191.178 mph. 3. (10) Aric Almirola (P), Ford, 190.968 mph. 4. (12) Ryan Blaney (P), Ford, 190.934 mph. 5. (2) Brad Keselowski (P), Ford, 190.725 mph. 6. (20) Erik Jones, Toyota, 190.570 mph. 7. (18) Kyle Busch (P), Toyota, 190.543 mph. 8. (19) Daniel Suarez, Toyota, 190.449 mph. 9. (11) Denny Hamlin, Toyota, 190.027 mph. 10. (88) Alex Bowman (P), Chevrolet, 189.994 mph. 11. (41) Kurt Busch (P), Ford, 189.593 mph. 12. (78) Martin Truex Jr. (P), Toyota, 189.387 mph. 13. (9) Chase Elliott (P), Chevrolet, 190.027 mph. 14. (14) Clint Bowyer (P), Ford, 189.980 mph. 15. (17) Ricky Stenhouse Jr., Ford, 189.787 mph. 16. (31) Ryan Newman, Chevrolet, 189.747 mph. 17. (24) William Byron #, Chevrolet, 189.733 mph. 18. (21) Paul Menard, Ford, 189.122 mph. 19. (6) Trevor Bayne, Ford, 189.095 mph. 20. (1) Jamie McMurray, Chevrolet, 188.818 mph. 21. (37) Chris Buescher, Chevrolet, 188.818 mph. 22. (48) Jimmie Johnson, Chevrolet, 188.627 mph. 23. (3) Austin Dillon, Chevrolet, 188.547 mph. 24. (34) Michael McDowell, Ford, 187.891 mph. 25. (47) AJ Allmendinger, Chevrolet, 187.715 mph. 26. (95) Regan Smith, Chevrolet, 187.467 mph. 27. (42) Kyle Larson (P), Chevrolet, 187.162 mph. 28. (38) David Ragan, Ford, 187.136 mph. 29. (43) Bubba Wallace #, Chevrolet, 186.554 mph. 30. (13) Ty Dillon, Chevrolet, 186.079 mph. 31. (32) Matt DiBenedetto, Ford, 185.612 mph. 32. (15) Ross Chastain(i), Chevrolet, 183.993 mph. 33. (96) Jeffrey Earnhardt, Toyota, 183.250 mph. 34. (72) Corey LaJoie, Chevrolet, 183.138 mph. 35. (00) Landon Cassill(i), Chevrolet, 182.278 mph. 36. (23) JJ Yeley(i), Toyota, 181.184 mph. 37. (99) Kyle Weatherman, Chevrolet, 180.650 mph. 38. (51) BJ McLeod(i), Chevrolet, 178.141 mph. 39. (7) Reed Sorenson, Chevrolet, 177.889 mph. 40. (66) Timmy Hill(i), Toyota, 177.708 mph.